In a pavilion at King Hildebrand's palace, courtiers wait expectantly for the arrival of King Gama and his daughter Princess Ida, who was betrothed in infancy to Hildebrand's son, Prince Hilarion (Search throughout the panorama). 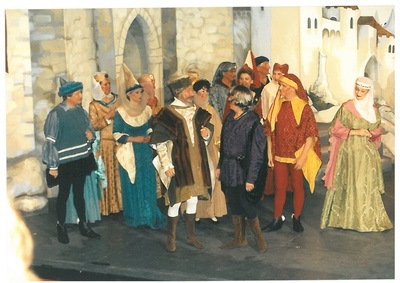 Hildebrand promises to wage war against Gama if the Princess should fail to appear (Now hearken to my strict command), while Hilarion, who is in love with Ida, although he has not seen her since he was two years old, wonders how she may have changed over the ensuing twenty years (Ida was a twelvemonth-old). Ida's war-like (and dull) brothers Arac, Guron and Scynthius, arrive at Hildebrand's palace (We are warriors three) preceding their father. King Gama enters, explains his misanthropy (If you give me your attention I will tell you what I am), and promptly displays it by insulting Hildebrand and his son. He then announces that Princess Ida has forsworn men and founded a women's university at Castle Adamant, one of his many country houses. The two Kings advise Hilarion to go to Castle Adamant to claim Ida, and that if she refuses him, Hildebrand will storm the castle (Pr'haps if you address the lady). But Hilarion plans to use romantic means, rather than force, to gain the princess's love. He explains that nature has "armed" him and his friends, the courtiers Cyril and Florian, to win this "war" (Expressive glances will be our lances). The three set off to Castle Adamant, while King Gama and his sons are to remain at Hildebrand's palace as hostages (For a month to dwell in a dungeon cell). 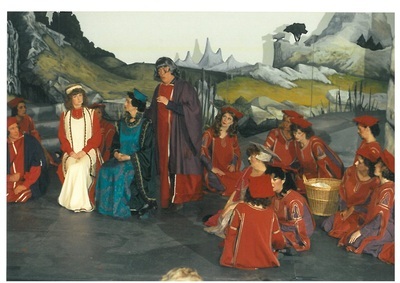 Act II At Castle Adamant, Princess Ida's pupils learn that "man is nature's sole mistake" (Towards the Empyrean heights). One of the Professors, Lady Blanche, doles out the punishments for the day, for "offences" that include bringing chessmen to the university – "men with whom you give each other mate" – and for sketching a double-perambulator. 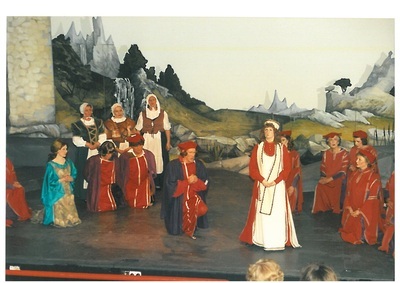 Princess Ida arrives (Minerva! Oh hear me) and delivers a stern lecture, stating that women's brains are larger than men's, and predicting that woman shall conquer man, but that once having conquered, woman will treat man better than he has treated her. 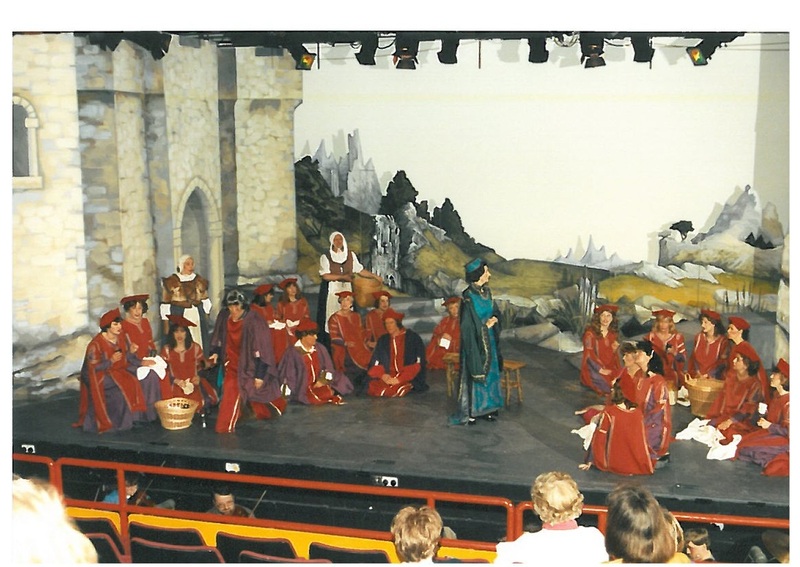 Lady Blanche resents the Princess and predicts that one day she will replace her as head of the university (Come mighty must, a song often cut from the D'Oyly Carte productions). Hilarion, Cyril and Florian sneak into Castle Adamant (Gently, gently). They scoff at the idea of a woman's college. Finding some discarded academic robes, the three men disguise themselves as young maidens wishing to join the university (I am a maiden cold and stately) and are welcomed by Princess Ida (The world is but a broken toy). Florian realises that their disguises won't fool his sister, Lady Psyche (one of the professors), and they take her into their confidence. Lady Psyche warns them that they will face death if the Princess discovers who they are and informs them of the Princess's theories on man, using a parable about an ape who falls in love with a high-born lady to illustrate her point that Darwinian "Man, sprung from an Ape, is Ape at heart" (A lady fair of lineage high). Illustration by Gilbert for the "Darwinian Man" song; compare with Darwin image above. Melissa, Lady Blanche's daughter, has overheard them, but, fascinated by the first men she has ever seen, swears herself to secrecy. She falls in love with Florian at first sight, and the company celebrate joyously the discovery that men are not the monsters that Princess Ida had claimed (The woman of the wisest wit). Lady Blanche, who has not fallen for the men's disguises, confronts Melissa. 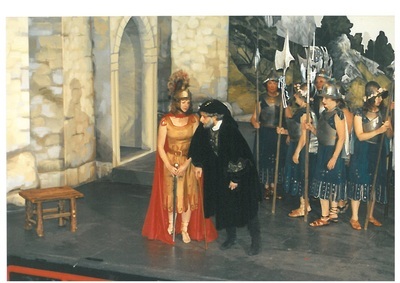 Though indignant at first, she is persuaded to keep the men's secret when her daughter points out that if Hilarion is able to woo Princess Ida, Blanche will become head of the university (Now, wouldn't you like to rule the roast?). During lunch (Merrily rings the luncheon bell), Cyril gets tipsy and inadvertently gives away his friends' identity by singing a bawdy song (Would you know the kind of maid). 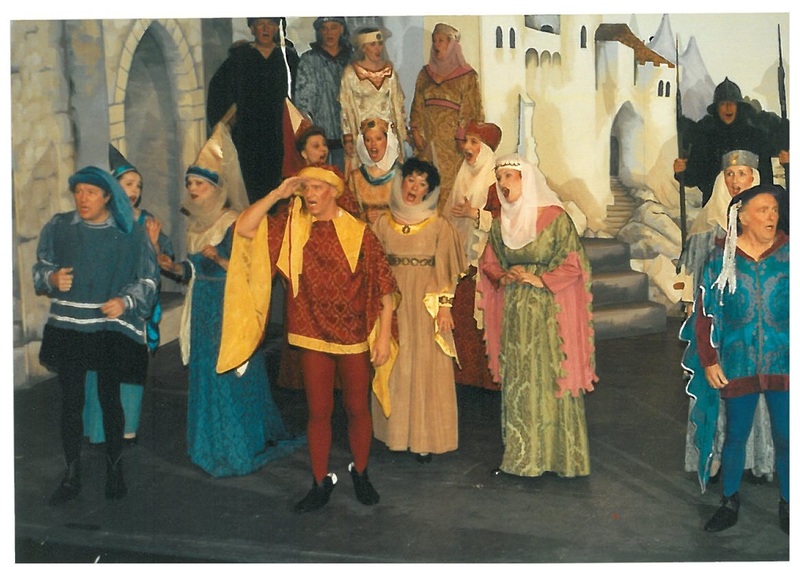 In the ensuing confusion, Princess Ida falls into a stream, and Hilarion rescues her (Oh joy, our chief is saved). Despite her rescue, Ida condemns Hilarion and his friends to death. Hilarion counters that without her love to live for, he welcomes death (Whom thou hast chained). King Hildebrand and his soldiers arrive, with Ida's brothers in chains. He reminds her that she is bound by contract to marry Hilarion and gives her until the following afternoon to comply (Some years ago) or incur the guilt of fratricide. The defiant Ida replies that, although Hilarion saved her life and is fair, strong, and tall, she would rather die than be his bride (To yield at once to such a foe). 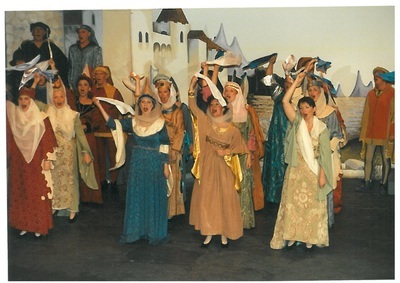 Act III Princess Ida reviews her student troops' readiness to meet Hildebrand's soldiers in battle, but the terrified girls admit that they are afraid of fighting (Death to the invader!). Princess Ida is disgusted by their lack of courage and vows that, if necessary, she will fight Hildebrand's army alone (I built upon a rock). Her father, King Gama, arrives with a message that Hildebrand prefers not to go to war against women. He reveals that Hildebrand has been torturing him by treating him in luxury and giving him nothing to complain about (Whene'er I spoke sarcastic joke). He suggests that, instead of subjecting her women to all-out war, she pit her three strong, brave brothers against Hilarion and his friends, with Ida's hand to depend on the outcome. Ida is insulted to be "a stake for fighting men" but realises that she has no alternative. Hildebrand's forces enter, together with Gama and his three sons (When anger spreads his wing). Hilarion, Cyril, and Florian are still in their women's robes, and King Gama and his sons ridicule them. In preparation for battle, Gama's sons shed their heavy armour, saying that it is too uncomfortable for combat (This helmet I suppose). The fight ensues, with Hilarion, Cyril, and Florian defeating Gama's sons (It is our duty plain). If you enlist all women in your cause,And make them all abjure tyrannic Man,The obvious question then arises, "HowIs this Posterity to be provided? "Princess Ida admits, "I never thought of that!" Hilarion makes an emotional appeal, urging her to give Man one chance, while Cyril observes that if she grows tired of the Prince, she can return to Castle Adamant. Lady Psyche says that she, too, will return if Cyril does not behave himself, but Melissa swears that she will not return under any circumstances. Finally, Ida admits that she has been wrong, and declares that indeed she loves Hilarion, ending with a quotation directly from the Tennyson poem. All celebrate, (With joy abiding).